These no-cook skewers are the perfect way to get your healthy dose of the Mediterranean diet. They're colorful, delicious, and one skewer with vinaigrette is only about 150 calories, with a gram of fiber, and some protein too. These no-cook skewers are the perfect way to get your healthy dose of the Mediterranean diet. They're colorful, delicious, and one skewer with vinaigrette is about 160 calories, with a gram of fiber and some protein too. Plus, did we mention that they're made with artichoke hearts? Artichokes are one of our favorite superfoods because they contain magnesium and other healthy nutrients. This recipe couldn't be simpler. Just whisk together the vinaigrette ingredients--tomato juice, vodka, Worcestershire, hot sauce, horseradish, oil, celery, salt, and pepper--in one bowl and chill. 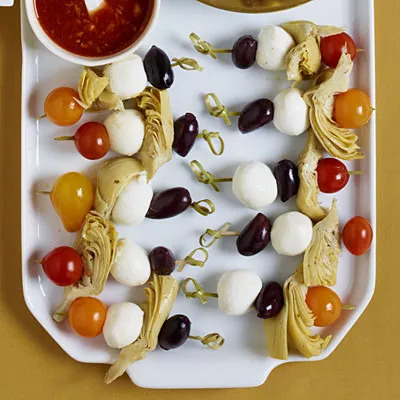 Thread a bocconcini ball, tomato, artichoke, and olive on each skewer and serve with the vinaigrette. Ingredients: tomato juice, vodka, Worcestershire sauce, celery, kosher salt, freshly ground black pepper, grape tomatoes, artichoke hearts, kalamata olives, hot sauce, horseradish, extra-virgin olive oil.